Have you ever wanted to show your WooCommerce store visitors different products based on their geolocation? Now you can with the Logic Hop WooCommerce Add-on! In this tutorial we’ll show you how to quickly and easily personalize WooCommerce sites using any theme that supports the homepage action – You’ll find this homepage action functionality in the Storefront theme or any Storefront child theme as well as a number of other WooCommerce compatible themes. Don’t worry, if you’re using a different theme you can still personalize your site! Be sure to follow along in the tutorial video below. 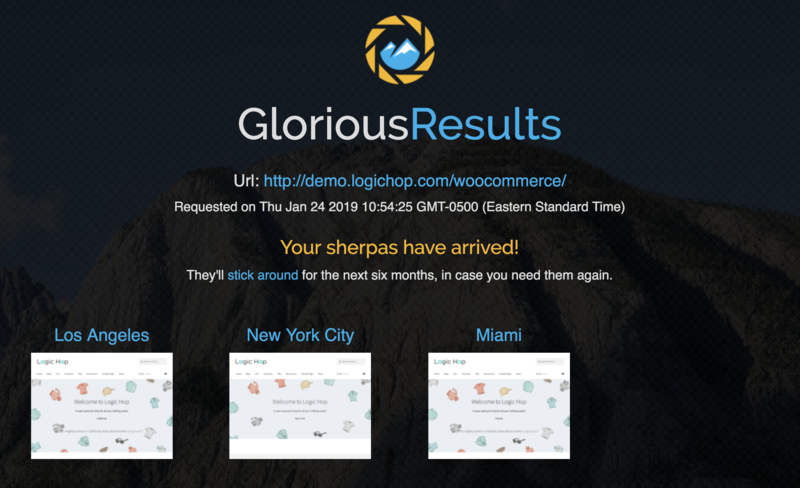 The Logic Hop WooCommerce Add-on automatically adds a new Storefront homepage content module called Storefront Homepage Widget Area and it does exactly what the name implies, adds a widget area as a content module on your homepage. Why is this important? 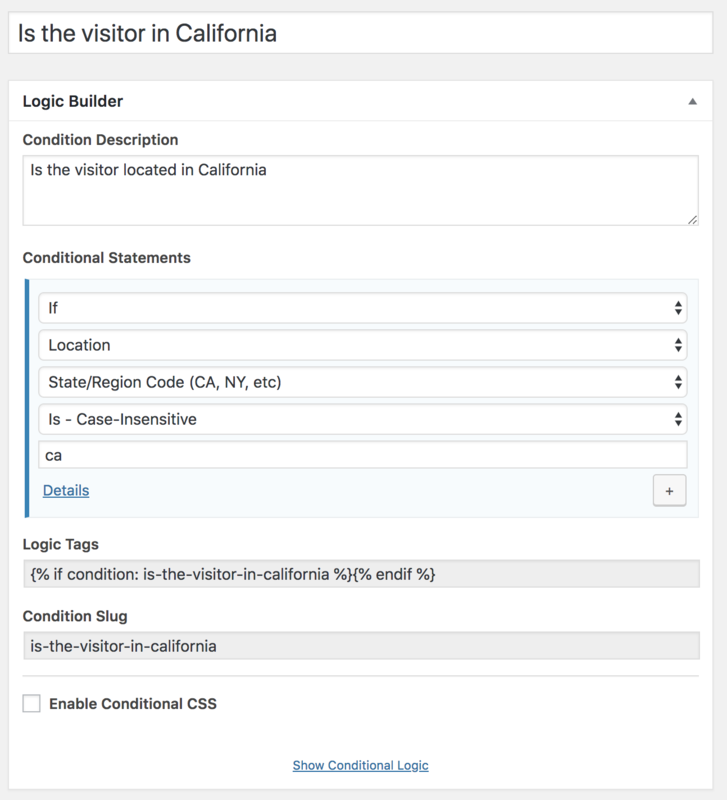 Because Logic Hop makes it super easy to personalize your site with Conditional Widgets – Simply select the condition that determines when to display the widget. What condition is your condition in? The best way to think about conditions is that they’re like questions, such as Is the visitor in California? or Did the visitor click our Google Ad about cats? 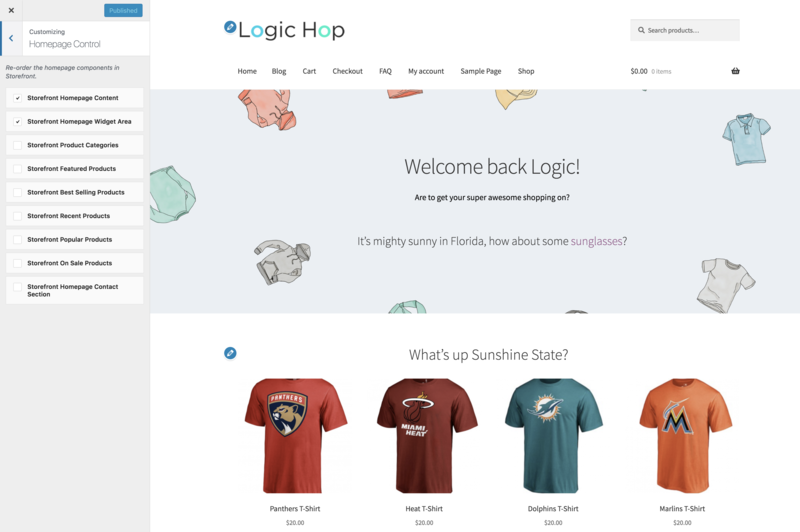 Of course you’ve already installed Logic Hop and our WooCommerce Add-on. Easy peasy. You can start to see the logic here, and really this is the perfect way to work through personalization scenarios. Ask the questions to formulate the logic which will display your content. For our tutorial we want to show California sports team t-shirts to people in California. Is the visitor in California? And we want to show Florida sports team t-shirts to people in Florida. Is the visitor in Florida? And we want to show our other products to everyone else. Is the visitor not in California or Florida? Hint: An even easier way is to ask us – We’re happy to help you work out your personalization needs. We’ll help craft what you need and send you the conditions as an easy-to-add Logic Hop Recipe. Let’s get this personalization party started! Simple right? And remember, if you downloaded the recipe for this tutorial, all of these conditions are created automatically. Now we’ll add the final condition. 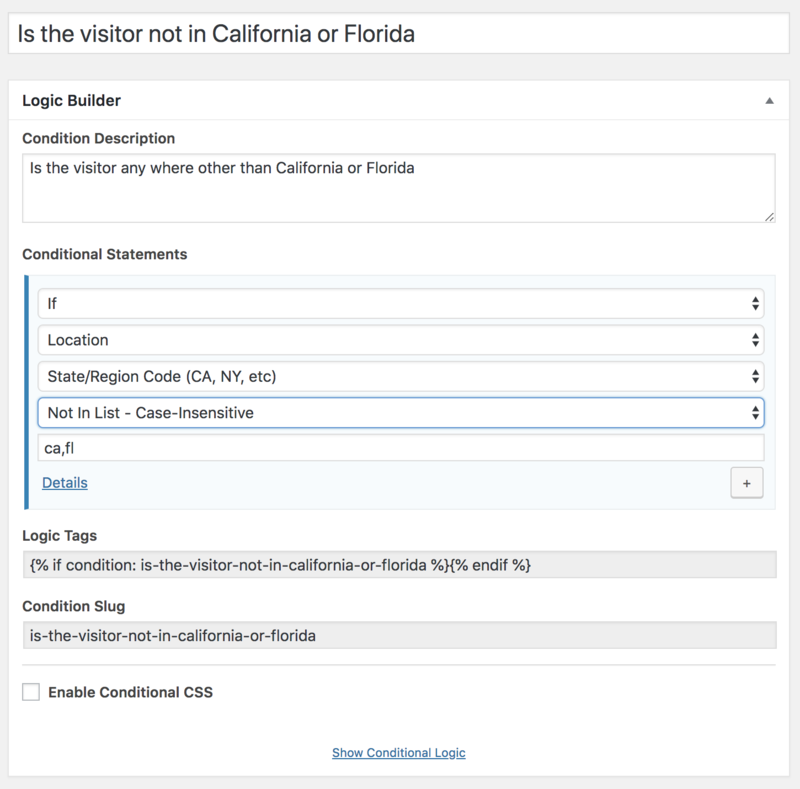 This is the important one that will display content if the two previous conditions were not met – If the visitor is not in Florida or California. What’s nice about this is by using a comma-separated list we can combine multiple values into one condition statement. So you’re probably already thinking can I use the to show products based on people in multiple states, and the answer is yes! 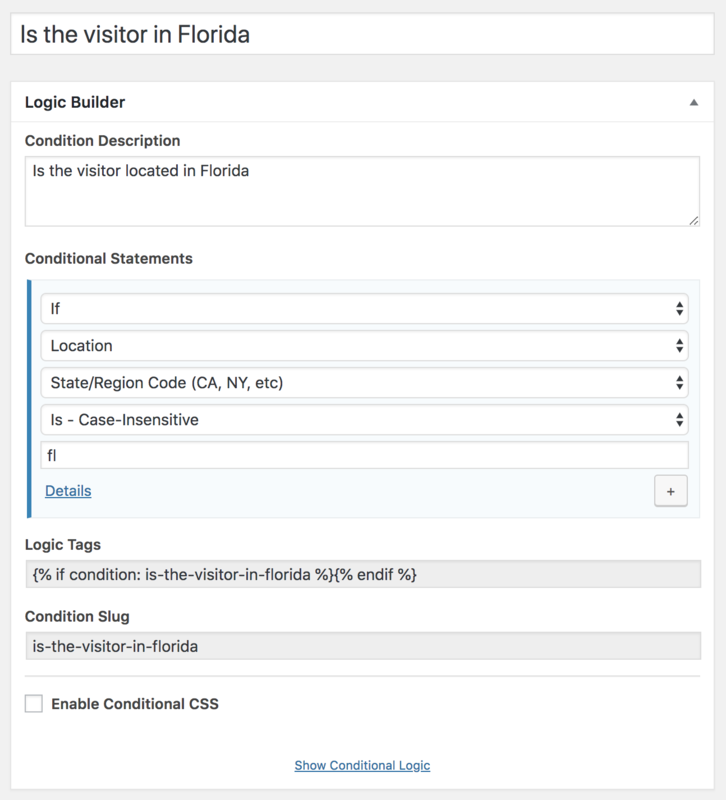 Now that our conditions are in place, let’s navigate to our WooCommerce Products and create two new product categories – One named California and the other, Florida. Then go ahead and add at least four products to each. With products assigned to our two new categories we can navigate over to Appearance > Widgets. Set the title to What’s up Cali? Set the title to What’s up Sunshine State? Now that our conditions are in place, our products have been added to the categories and we’ve created our Conditional Widgets we can move on to the final step. With everything in place now we can see our personalization in action – Just open your homepage in a browser. What do you see? If you’re in Florida or California you’ll see the title and content for that state. If your not in either you’ll see the default products. Ok we’re done! There you go! You’ll see screenshots of your website from each location. Personalizing your WooCommerce products based on geolocation is just the tip of the iceberg. Let’s say you had a social media post congratulating the New England Patriots. You could certainly target visitors in New England states, but you know some of those people are bound to be Giants and Jets fans. You certainly wouldn’t want to alienate your customers! The possibilities for personalization are endless! And you know, sometimes having all those options might seem a little bit daunting… That’s where Logic Hop comes in. We’re happy to help you come up with personalization solutions that work for your content. Just drop us a line or book a time with us and we’ll help work out personalizations for your website! Homepage Actions can be easily added to any theme. Check out these simple instructions on how enable it for your theme. You can also use the techniques from this tutorial with any widget area on your site. Looking for other ways to add personalization? Be sure to check out our Logic Blocks which support all of the WooCommerce Shortcodes.